Seafood is our business. We are passionate about ensuring the sustainable management of the species that constitute our livelihood. This includes the protection and enhancement of supporting ecosystems and bird life. Accidental by-catch is an unfortunate consequence of our industry and we are very serious about reducing our impact as much as possible. We constantly promote awareness, make alterations and trial different methods to reduce incidental catches and death rates. 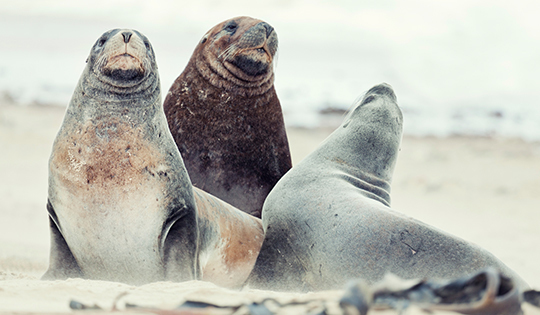 The New Zealand seafood industry‘s development of Sea Lion Exclusion Devices (SLEDs) and our work with Precision Seafood Harvesting are examples of innovation that address this issue. SLEDs are solid stainless steel grids inserted into the trawl net that allow sea lions to escape unharmed when they encounter the grid. Scientific observations have proved that SLEDs direct the majority of sea lions out of the net, the small number of sea lions that are still caught are recorded as protected species by-catch. 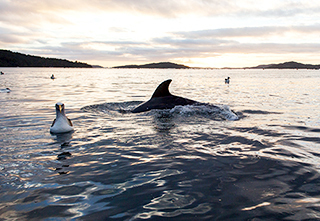 Sanford has a long history of working with other organisations on the management and protection of our oceans and protected indigenous ocean species. Māui dolphin is the world's rarest and smallest marine dolphin. They are only found off the west coast of New Zealand's North Island in relatively shallow waters. The population is so dangerously low that the species is on the brink of extinction. The last survey estimated that there are only 63 dolphins over the age of one year. Sanford and Moana New Zealand want to see a future where the Māui dolphin population rebounds and expands. We have a responsibility to do everything possible to remove fishing-related threats to their survival. You can read more about our plan here. 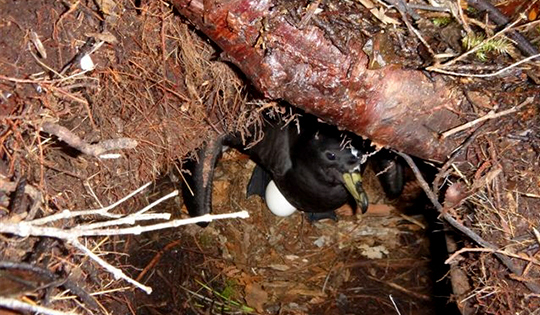 Each spring the Black Petrel (tāiko) returns home to breed on Great Barrier and Little Barrier Islands in the Hauraki Gulf. In 2014, the Ministry for Primary Industries ‘National Plan of Action for Seabird’ identified Black Petrel as the seabird most at risk from fishing activity. In response, Southern Seabird Solutions invited Sanford to take part in a collaborative working group of commercial and recreational fishers, charter fishing companies, environmental groups, government agencies, local bodies and iwi. This group has challenged itself to implement best practice seabird mitigation measures, to achieve continuous improvement in the reduction of Black Petrel fishing related mortalities. Sanford is committed to helping ensure the survival of the Black Petrel and we have a range of initiatives to make sure all our fishers are seabird-smart on the water. Our fishers are proud to be a part of this group and we believe that this kind of stakeholder collaboration could result in the successful management of other key protected species. The sustainability of our raw materials is central to our business model. We do not expect or require exclusive rights to the ocean’s resources, however where we believe proposed activities could have negative biological and ecosystem repercussions that will affect commercial fisheries, we will speak out. This was the case in relation to the Chatham Rise and the application to mine phosphorite from this very significant area of ocean space to the east of New Zealand. The Chatham Rise is a very productive and vibrant biological area with many deepwater fishstocks inhabiting the ecosystem at some stage of their lifecycle – whether as a spawning ground, a nursery area for juvenile fish or as a habitat for larger fish. As a commercial fishery, the Chatham Rise is an exceptionally important area with significant economic value to Sanford. All Sanford deepwater vessels fish at some time of the year on the Chatham Rise. In response to global concern associated with shark finning, the Ministry for Primary Industries (MPI) has made it illegal (from 1 October 2014) for a commercial fisher to remove the fins from any shark and discard the trunk at sea. Sanford’s Shark Policy requires all our vessels and fishers and fishing companies that we do business with to maintain full legal compliance. New Zealand shark stocks are among the best managed and well-studied in the world. New Zealand manages commercial catches of 11 shark species in the Quota Management System, which sets catch limits based on stock assessments, monitoring at sea and long term sustainability targets. Additionally, we always uphold animal welfare legislation and do not condone cruel practices such as live finning under any circumstances. New Zealand tuna stocks are managed by the Ministry for Primary Industries. Sanford Limited is a fishing company that harvests free schooling skip jack tuna inside New Zealand waters by purse seining. As part of its wild harvest fishing operation Sanford does not use Fish Aggregation Devices (FADs) for the catching of any fish species, including tuna. Sanford buys to on-sell some tuna species from independent fishers, who catch inside New Zealand waters. These fish are caught on hooks by troll and surface long lining methods. All tuna caught by independent fishers that land into Sanford can be traced to a fishing vessel and a fishing region. No independent fisher landing tuna into Sanford, or selling tuna to Sanford, uses FADs. Sanford will keep consumers informed of our tuna harvesting policy by publishing this policy on our website. Sanford operates to a Zero Fish waste policy by sending all marine trimmings to fishmeal. Increasingly we are investigating ways to better utilise these products by adding value, including nutraceuticals, pet foods and fertilisers. This year, for the first time, Sanford participated in the Australasian Reporting Awards (ARA). The ARA invites organisations to submit their most recent annual report to be reviewed by leading industry professionals on the ARA examining committees. We are very pleased to announce that our first Integrated Annual Report received the ARA Gold Award for reporting; and was an ARA Finalist Award for Integrated Reporting. To win the gold award, our report needed to: present a balanced and reasonable picture of our economic, environmental, and social performance; facilitate comparability, benchmarking, and assessment of performance; and address issues of concern to stakeholders.